More than 40,000 people are expected to participate in Ottawa Race Weekend, Canada’s biggest running event. If you are running in one of the many events (ranging from a 2k run on Saturday to the full marathon on Sunday), we wish you the best of luck in smashing your time goals! Even if you’re not the running type, we encourage you to get out there and volunteer or cheer on the runners as a spectator. There will be many road closures and detours as a result of Race Weekend, so make sure you are aware of the street closures in the downtown area over the weekend. This helpful map identifies the major closures depending on the time of day as runners move through the city. The weather is expected to be nice for this year’s edition of the Great Glebe Garage Sale, which promises to be the biggest sale yet. Head down to the Glebe from 8:00 to 3:00 on Saturday as homeowners and vendors who set up shop at the Glebe Community Centre and Glebe Collegiate Institute hawk their wares. 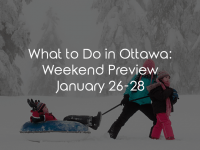 The event is in support of the Ottawa Food Bank, and vendors and bargain hunters alike are encouraged to give a portion of their earnings or savings to help those in need. You never know what you’ll find, as everything from clothes and household goods to DVDs, artwork, and miscellaneous goods will be on sale at unbeatable prices. Will this be the year you find a hidden treasure? 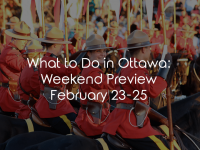 Are you ready to take a road trip to one of the many beautiful small towns that surround the city of Ottawa? The Dandelion Festival is a celebration of arts and culture in Old Town Kemptville, a historic community located about 50km southwest of Ottawa. It’s a rich opportunity for the whole family to discover the heritage of Kemptville. 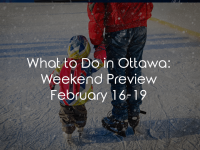 There are many free activities for kids, like painting, chalk time, and sliding down the giant Ottawa Senators slide. Enjoy homegrown music, great food, and historical reenactments. The whole event kicks off with a gourmet five-course Dandelion Dinner that showcases the talents of Kemptville’s finest chefs. Tickets for this tasty dinner are $75 each. Head to Minto Park on Sunday for a free outdoor fair hosted by the artistic collective Ravenswing. Take part in workshops from writers, musicians, and artists, covering everything from yoga to science. 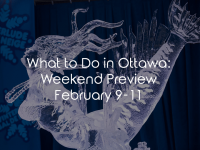 Listen to innovative musicians, browse the art gallery and buy a one-of-a-kind piece, or take home a craft from some of Ottawa’s finest artisans and craftspeople. Admission is free, so head to the Elgin Street area for an afternoon and support our local artistic community. Once you’ve whet your artistic appetite, you can head down to one of the many patios on Elgin Street and enjoy a capper to a perfect weekend.